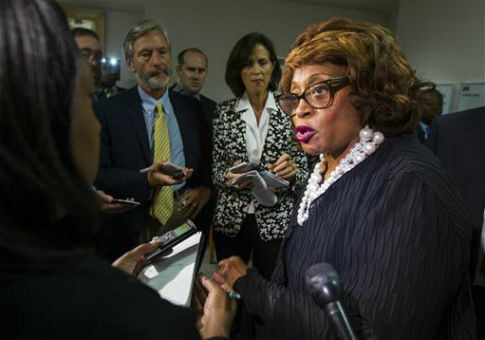 The attorney for former Democratic Rep. Corrine Brown (Fla.) named three members of Congress, all fellow Democrats, as potential defense witnesses for Brown's upcoming fraud trial. Reps. Sheila Jackson Lee (D., Texas), Bennie Thompson (D., Miss), and Marcia Fudge, (D., Ohio) were all named on the witness list, filed Friday evening with Jacksonville, Florida's federal court, and are expected to be asked about Brown's involvement with causes she addressed in Congress, the Florida Times-Union reported over the weekend. Jesse Jackson, University of North Florida President John Delaney, and civil rights activists Martin Luther King III are also on Brown's witness list of 33 people. Brown is accused of enriching herself with money from the One Door for Education, a Virginia-based sham foundation that her supporters donated to. Prosecutors say the charity, a scholarship fund, collected $800,000 but only used $1,200 of that total to give out scholarships. Brown's former chief of staff, Ronnie Simmons, pleaded guilty to fraud conspiracy charges along with the president of the foundation, Carla Wiley. Both are expected to testify against Brown in the upcoming trial. The attorney for Brown, James W. Smith III, argued the Florida Democrat was too absorbed in her work to notice those around her engaging in a crooked scheme. Brown, who served 12 terms in Congress, lost reelection last year after being indicted. Opening arguments for Brown's fraud trial are scheduled for April 26. This entry was posted in Politics and tagged Corrine Brown, Florida, Fraud, Jesse Jackson, Sheila Jackson Lee. Bookmark the permalink.